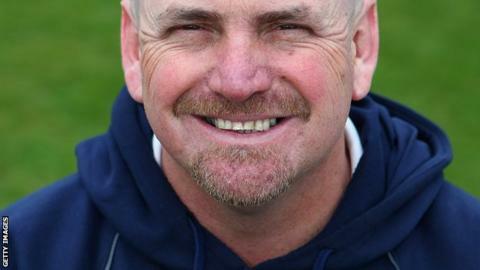 Head coach Karl Krikken has left Derbyshire after 27 years with the club as a coach and player. The 44-year-old was asked to reapply for his job following a restructuring of the coaching set-up, but has decided to pursue other opportunities. Krikken had a 17-year playing career with Derbyshire from 1987 and held various coaching positions before taking over as head coach May 2011. "It's sad his time at the club has come to an end," said chairman Chris Grant. "We thank him for his contribution to drafting the new elite player pathway, we respect his decision to seek opportunities elsewhere and we wish him all the very best for the future. "Karl was a stalwart as a wicketkeeper, his contribution as the first director of our academy was critical to our future and who can forget the glory of promotion, as Division Two champions, under his stewardship in 2012. "Our recruitment process will now continue and we are confident that the new Elite Performance structure will enhance our chances of success in the years to come across all three domestic competitions." The implementation of a new "elite cricket performance model" in January comes after relegation from Division One of the Championship last season. All the coaching team will have to re-apply for positions and the club will also be looking at external candidates. Krikken added: "I would like to thank the off-field staff, groundsmen, coaches, players and members for all their help and support during my time at Derbyshire. "As a player I was lucky enough to play with some magnificent cricketers that brought success to the county, winning a couple of one-day cups. "In the last couple of years during my tenure as head coach, I have been immensely proud to lead a team of great lads to the first trophy for Derbyshire in 19 years and last year to our highest Championship finish since 1996."